Welcome a newborn baby girl with this stylish and personalized "Pots of Luck" Baby Gift. The name Pots of Luck stems from the fact that a reusable flower pot is used as the base, helping to create a pretty as a flower baby gift. 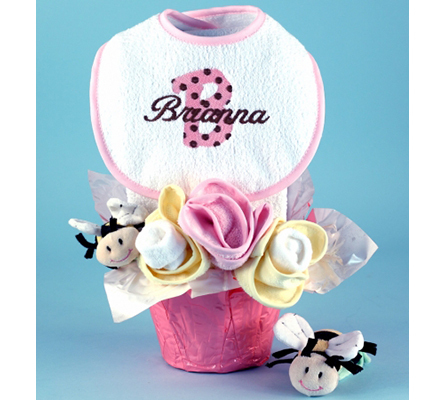 The name also expresses the perfect sentiment for a newborn baby gift. 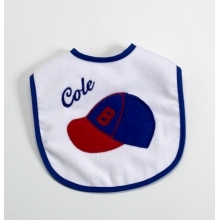 Every baby should have a bib as special as this one! The first thing the parents will notice about Pots of Luck is the attractive personalized bib. The white terry bib with either pink or blue contrast trim comes embroidered with baby's name over a fabric applique of baby's first initial. The result is a bib that's as personal as it is special. 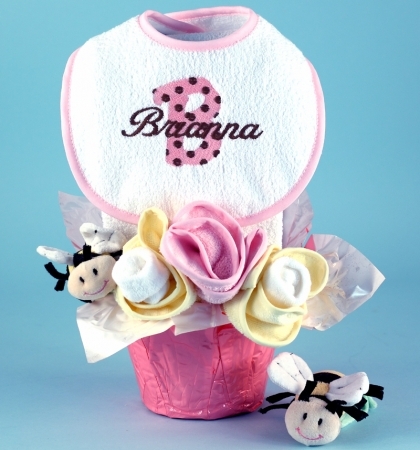 The complete list of included items is as follows: Personalized Terry Bib Terry Burp Cloth 3 Terry washcloths Pair of Socks Soft bee wrist rattle Flower pot Pretty as a flower Each component is artfully presented to simulate an arrangement of beautiful flowers. Tulle gift wrapping (not shown) is added for the final elegant touch. The bib, burp cloth & washcloths are proudly made by Silly Phillie in the USA from domestic cotton terry fabric.